Note: This is a sponsored post in collaboration with Jilt Abandoned Cart Recovery. Abandoned carts play a major role in lost revenue for most ecommerce stores. When customers put a product in their cart and then leave the website without checking out, it can leave businesses wondering what wasn’t up to scratch and how can they get the customer to reconsider making the purchase again. While there are many factors that play into why customers abandon their carts, a productive use of time is for businesses to start attempting to recover those abandoned carts as soon as possible. Leave customers too long and they may forget what or why they were purchasing in the first place, or they may go somewhere else to buy the product. One of the best and most efficient ways to engage with customers to get them interested in revisiting their cart is to send them an abandoned cart recovery email. With these emails the business simply reaches out to the customer and lets them know their product is still waiting in their cart and it’s ready for them to continue the checkout process. But, most ecommerce businesses don’t have the time to be sending out abandoned cart recovery emails all day; it could be extremely time consuming depending on how many abandoned carts your business incurs. 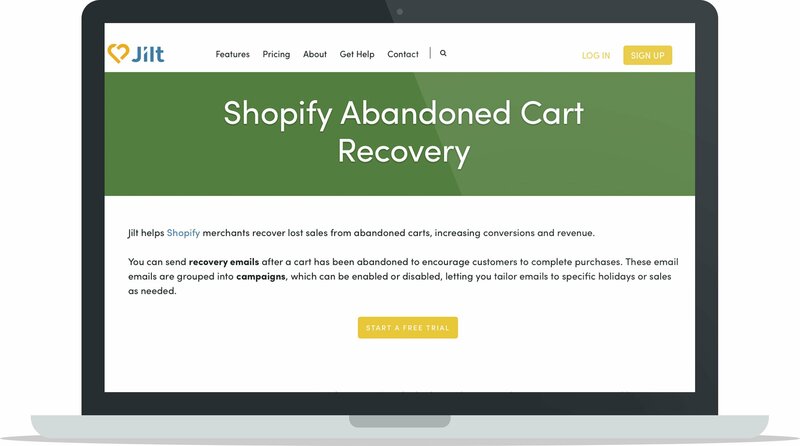 The best course of action is to use a service that can help your business send out abandoned cart recovery emails automatically so you can connect with your customers and remind them to complete the checkout process without having to manually reach out to them every time. This is where Jilt comes in. Jilt is an abandoned cart recovery service that helps businesses create automated recovery campaigns so they can reach out to customers, remind them of the products waiting to be purchased in their shopping cart and encourage them to resume their purchase. Jilt focuses on helping businesses rescue lost revenue so they can sell to more customers, more efficiently. Jilt specializes in making the process of abandoned cart recovery seamless so businesses can fully automate their system and save precious time and energy in doing so. They also make many aspects of the process fully customizable so each business can put their own touch, flair and branding on the emails to maintain complete authenticity. For businesses who don’t know where to start when it comes to abandoned cart recovery emails, Jilt uses industry best practices for email design and content which every business can use to help start them off on the right foot. Jilt knows their stuff when it comes to abandoned cart recovery emails and their service helps you put their industry knowledge and useful tools into practice on your own customers so your business can reap the rewards. Jilt is for any and every business that’s interested in recovering lost revenue from abandoned shopping carts. Every business goes through the struggle of watching abandoned carts pile up in their analytics charts and seeing all the purchases that could have been. It can be tough knowing that customers were interested enough in the product to actually add it to their basket and then something distracted or deterred them from actually following through with the purchase. It’s tough, but you have options to save at least some of the lost revenue. 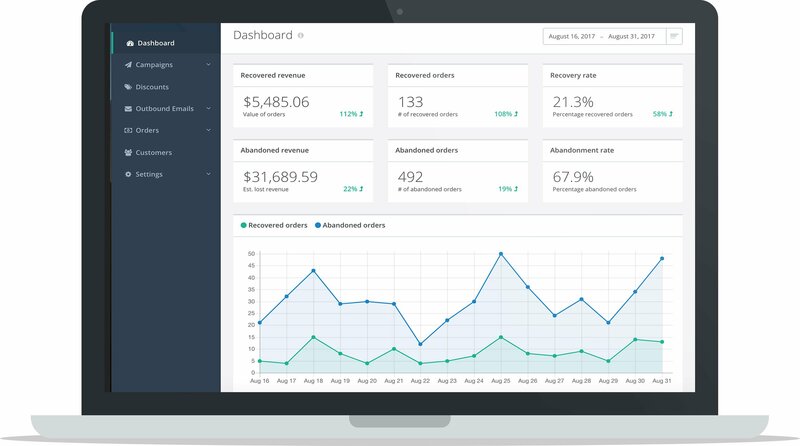 If you’re interested in increasing your business’ sales, encouraging visitors to complete their purchase and recovering some of your lost revenue, then Jilt is for you. It’s a simple tool to implement into your store that has the ability to increase your sales in a major way, so you have a lot to gain. Since we began using Jilt for A Better Lemonade Stand we’ve had a lot of success targeting customers who have abandoned their carts, and have experienced a significant increase in revenue because we’ve been able to recover so many of them. 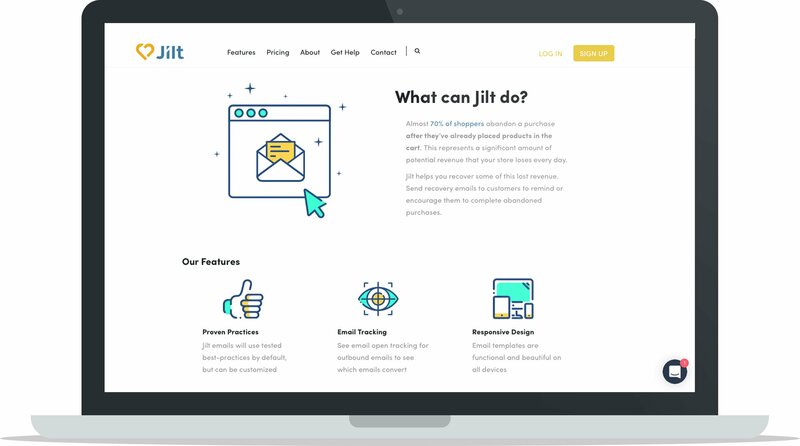 You don’t have to be an expert at email marketing to create an effective abandoned cart recovery email as Jilt already has pre-designed email templates ready for you to use and customize to your full advantage. Since they’re experts in abandoned cart recovery emails, they know what it takes for these emails to be successful and they help you take out the guesswork by giving you the tools to create a winning recovery email, every time. Simply edit their templates to suit your business, add customer information and branding, and you’re ready to go. 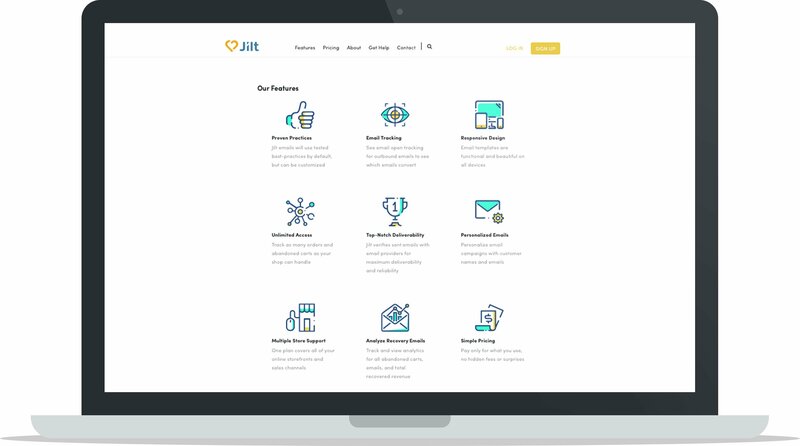 The templates are highly customizable so every business can work with Jilt to make sure they look exactly how they want them to, and each email is fully optimized for all devices so your customers get the best experience no matter which device they’re viewing from. There is no limit to how many campaigns you can create within Jilt, so no matter how many sales or seasonal events you host throughout the year, you can enable or disable your campaigns as needed. 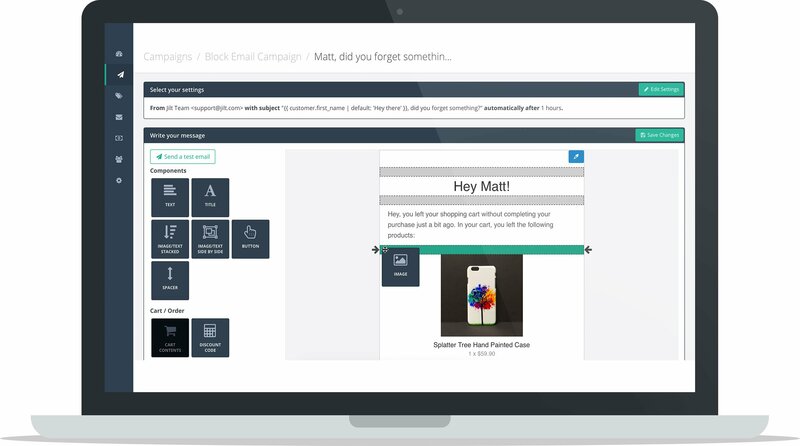 Each campaign starts with a pre-designed email template you can customize, and a timer you can set that will trigger whenever a cart is abandoned. Unlike some abandoned cart email recovery services, Jilt enables you to customize when your emails get sent out automatically, down to the minute. 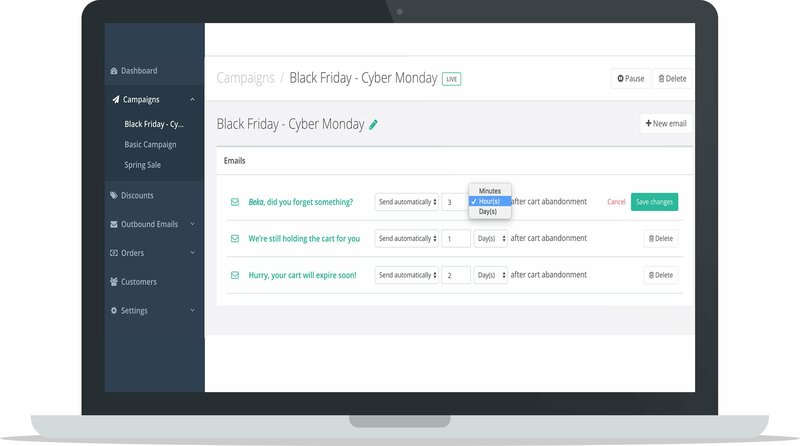 Whether you want the email sent out a few days from when your customer abandons their cart, a few hours or a few minutes, the option is entirely yours and you can change the schedule with every campaign you create. In order for you to see your progress and the effect Jilt has on your abandoned cart recoveries, Jilt tracks all abandoned and recovered orders automatically. 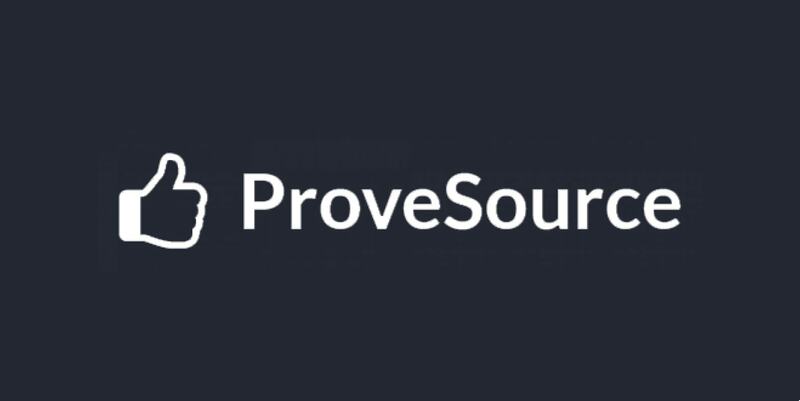 View carts that have been recovered and those that haven’t, see your recovered revenue totals, see recovered cart percentages, and track all the metrics and campaign performances so you can constantly evaluate your efforts and improve your strategies. Jilt also stores this data on their end so you can keep your website fast and not bogged down by all the metrics. Whether your guests have a registered account on your website or they check out as a guest, as long as they’ve entered an email at any time in the checkout process Jilt can send a recovery email to their address. Jilt integrates with three main ecommerce platforms: Shopify, WooCommerce and Easy Digital Downloads, making it an easy addition to most ecommerce stores. 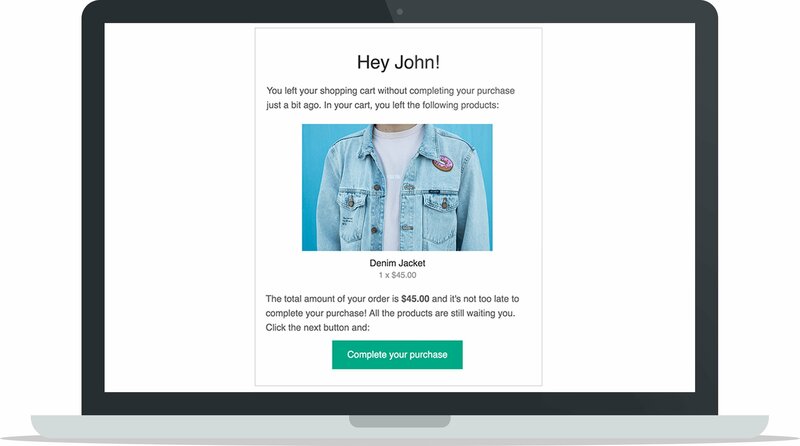 Jilt cuts down the number of clicks a customer needs to complete to make their purchase, as recovery links regenerate the cart and take customers right to checkout. Jilt ensures that recovery links last forever, not just a few days, so your customers always have the cart available when they read your email. Cart regeneration from Jilt means customers can abandon an order on one device, but recover it on any device by using a recovery link in your email. One-click login allows customers automatic access to their accounts if they’re clicking a validated email that’s tied to a customer account, so customers can complete purchases quickly. The main advantage to using Jilt for your online business is that they make implementing an abandoned cart system into your day-to-day business extremely easy. They already have all the tools and functions you need to create successful abandoned cart recovery campaigns to send to your customers, all you have to do is customize them, set it and forget it. The primary disadvantage that some online businesses may run into is that Jilt may not integrate with the platform you sell on, but for most ecommerce businesses this won’t be a problem. 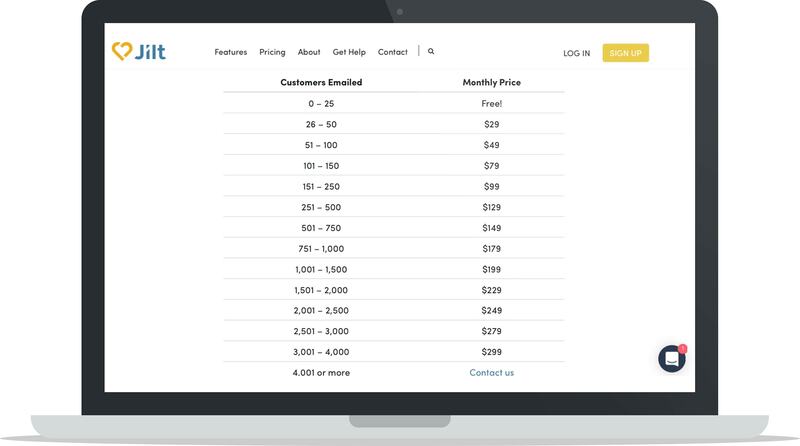 With Jilt you don’t pay by the total number of customers you have, you only pay by the number of customers you send a recovery email to in a monthly period. For example, if you have 2,000 customers per month but only send an abandoned cart recovery email to 250 of them, you only pay for those 250. Check out this preview of Jilt’s new email editor coming out soon. 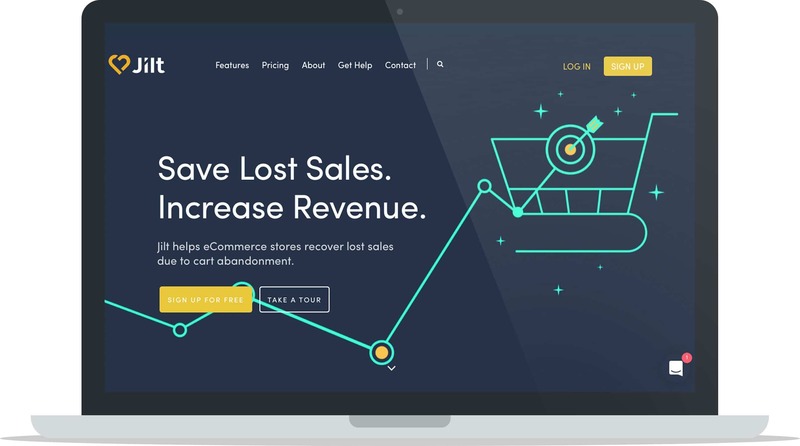 Don’t let your abandoned carts go unacknowledged when there’s a valuable tool like Jilt that can help you recover lost revenue. Think about all the abandoned carts your business incurs and what difference it could make to your overall revenue if some of those purchases could be restored. Jilt makes it so easy for businesses to create an effective abandoned cart recovery strategy and with so many of their useful features such as pre-design templates, unlimited campaigns, completely customizable schedules, data tracking, metric analytics and more, there’s so much value they offer to help you reach out to customers and successfully recover lost purchases. 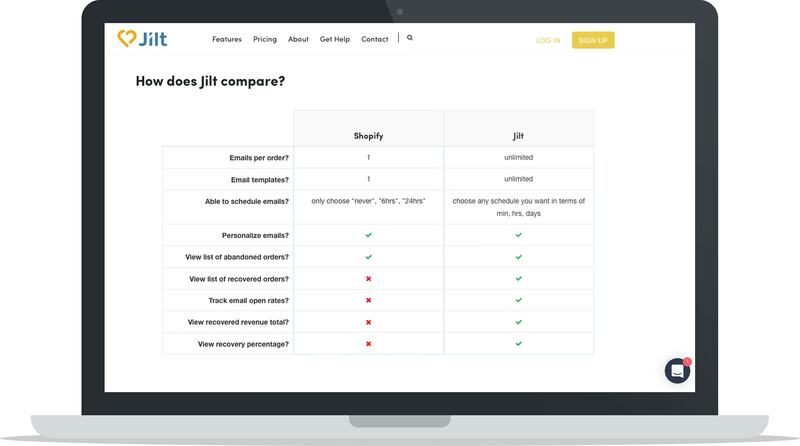 If you’re interested in increasing your sales and driving up your revenue and you haven’t implemented a successful and automatic abandoned cart recovery strategy, then Jilt is for you.